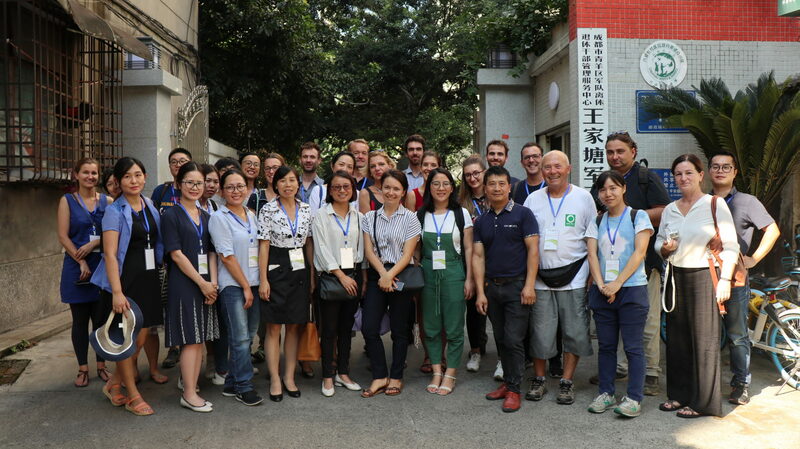 From 3th-5th of September CANGO, Stiftung Asienhaus and CAN Europe organized the China capacity building workshop in Chengdu, Sichuan Province, together with the local partner and 2018 Twinning participant Sichuan Green Foundation. Participants from Romania, UK, Germany, Belgium, Macedonia, France, and several Chinese provinces joined this event. 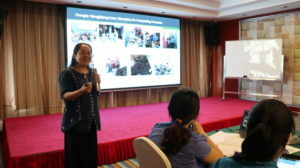 The workshop was supported by the Robert Bosch Stiftung and Stiftung Mercator. 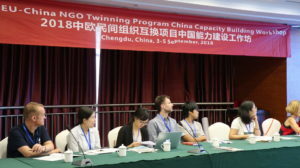 The purpose of the workshop is for the EU-China NGO Twinning Program participants to build up capacities, to share their experiences, initiatives, programs, and best practices on climate change, environmental protection, and social topics. 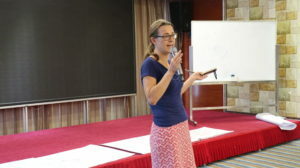 39 scholars, NGO staff from 10 European organizations and 11 Chinese organizations participated in this workshop. During the opening session on 3rd September, the participants were welcomed by Wang Xiangyi, Deputy Executive Director from CANGO, Judith Christ, Senior Project Manager from Robert Bosch Foundation, Zhang Yan, Project Manager from Stiftung Mercator, Dr. Nora Sausmikat, Head of the China program of Stiftung Asienhaus, Mathias Claeys Bouuaert, Project Manager from CAN Europe, Mr. Tong Wei, Division Director from Forestry Department of Sichuan Province and Dr. Ling Lin, Secretary General from Sichuan Green Foundation. Mr. Zhang Liming, Director from the International Collaboration Division of the Forestry Department of Sichuan Province also held a closing speech on the last day of the workshop. Civil Society actors and local government clearly showing that the best way to tackle the social and environmental problems of our times is to join forces. Mrs. Zhang Xuehua, Chief Scientist from Lishui Ecology Environment Institute, briefly described the innovative decentralized solid waste management model from the experience of Bengaluru, India, and experiments in Chengdu. During her presentation, she clearly presented the p2 pilot waste segregation practices and analyzed their successes and challenges for future duplication. Mr. Zhang Wen, Director of Sichuan Ecosystem Monitoring Center, Member of Sichuan Expert Guiding Committee of Combating Climate Change introduced the practices of Sichuan forestry carbon sequestration to cope with climate change, Mrs. Yang Mingming, sustainable rural development practitioner from the Chengdu Urban River Association (CURA) introduced the well-known model of sustainability and agricultural efficiency: Peace Dragon Village. On 4th September, Mr. Zhao Daxing, Executive Director from CANGO, gave a presentation on the opportunities and challenges of civil society development under the new International NGO Law in China. He talked about the requirements for overseas NGOs’ registrations which on one hand encourage NGOs to formalize their cooperation with Chinese partners, while on the other hand, the pose new bureaucratic hurdles to working in China. He also introduced some of the programs, which have successfully received a permit with the aid of CANGO after the implementation of the < Law of the People’s Republic of China on Administration of Activities of Overseas Nongovernmental Organizations in the Mainland of China> on 1st, Jan 2017. His analysis was followed by an ad hoc report by Judith Christ from the Robert Bosch Foundation. Judith Christ, Robert Bosch FoundationMrs. Christ explained how the changed legal landscape affects the on-the-ground work of foreign NGOs and Foundations like theirs. Dr. Horst Fabian , former East Asia program coordinator of CIM/GTZ and currently independent China researcher, shared his experiences and some of the Ford Foundation Study results on the European NGOs perspective of the INGO law (click here for more information). The study presented empirical data on the registration and document submitting procedure. Before the law’s implementation over 7000 international non-governmental organizations worked in China. So far only around 300 have successfully registered. Many more of them work under Temporary Registrations with a duration of 1 year. Finding a Chinese Supervisory Unit and agreeing on common work areas are among the biggest challenges. 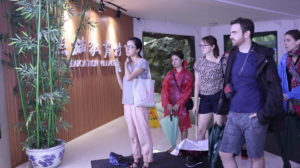 On 5th September, the twinners and alumni were provided the opportunity for a field trip to Dujiangyan Wild-Research Center (Panda Valley), Chengdu Research Base of Giant Panda Breeding. After having heard a talk on waste management, the twinners had the chance to visit a local project accompanied by Wei Wei (Twinning Alumni 2016), Project Officer of Chengdu Roots and Shoots. As an example for waste decentralization and community composting she showed participants around a recently developed waste pooling station. At the station, industrial buckets were used to collect and compost biodegradable waste by people living in the area. The compost was then used in community greening projects. 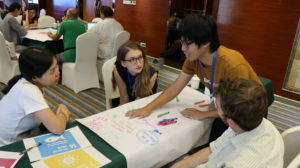 In the morning of the 4th Mathias Claeys Bouuaert, Project Manager from CAN Europe and Joanna Klabisch, Project Manager from Stiftung Asienhaus, led a World Café session on the Sustainable Development Goals (SDGs). After a short introduction on what the 17 goals that many nations agreed upon in Paris 2015, the participants were asked to identify the most relevant SDGs for work. The moderators posed 3 questions leading participants through the interlinkages between the SDGs and the value of a holistic network-based approach on using the goals in their work. In the first round, they had to identify the interlinkages between the SDGs on their chosen work tables. In the second round after a change of tables, they were asked to think about the potential relevance of the interlinkages for their current work. After a final change of tables, the twinners considered the opportunities these links might provide in their future work. The format was generally well received and considered one of the most productive parts of the meeting. Thus concluded 3 days of intense but productive cooperation in the city of Chengdu. For more information on the generell topic of communication between China and Europe also in regards to the NGO issue click here. 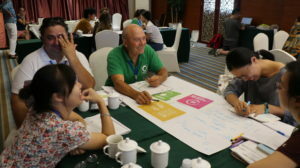 The main objective of the exchange is to exchange good practice in wetland center operation and promote the Wetland Link International(WLI) network for global wetland conservation for people and wildlife, particularly in a Chinese context. The exchange provides on-site nature maintenance and management experience, networking opportunities and develops ideas for joint working between wetland centres. The whole process contributes to better understanding of how the wetland centre model, wetland ecosystem conservation and services can work together for a sustainable future. The exchange will focus on getting to know each other’s work, exchanging best practices and potentially creating a network for further cooperation. Their goal is to support farmers and processors through policy work or providing marketing channels, as well as to connect the general public to the values of sustainable agriculture.